Dr. R.L. 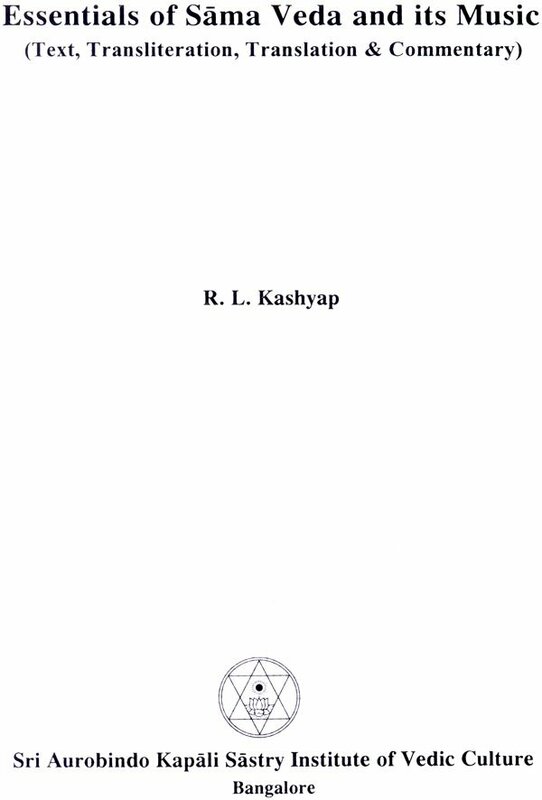 Kashyap is Professor Emeritus of Electrical and Computer Engineering at Purdue University, Lafayette, Indian in USA. He had his Master’s degree from Indian Institute of Science, Bangalore and obtained Ph. D from Harvard University. He is the recipient of many International awards. Recently he has received ‘Vedanga Vidvan’ award instituted by Maharshi Sandipani Vedavidya Pratishthan (Ujjain), and autonomous body of HRD, Govt. of India and ‘Jnana Keerti’ award instituted by Harsha Kriya Foundations, Bangalore. He has written extensively on Veda. Some of his widely read books on Veda are: ‘Krishan Yajur Veda Taittiriya Samhita, ‘Rig Veda-First Mandala’, ‘Rig Veda-Third Mandala’, ‘Rig Veda-Fourth Mandala’, ‘Rig Veda-Fifth Mandala’, ‘Rig Veda-Sixth Mandala’, Rig Veda-Tenth Mandala’, ‘Sama Veda-Purvarchika’, ‘Why Read Rig Veda’, ‘Rudra Mantras’, ‘Essentials of Atharva Veda’, ‘Essentials of Yajur Veda’, ‘Work Enjoyment &amp;amp; Progress’ etc. He is the Honorary Director &amp;amp; Trustee of Sri Aurobindo Kapali Sastry Institute of Vedic Culture, Bangalore. Sama Veda Samhita is the third in the traditional sequence of four Vedas. All its mantras are risks in some specified metres with names such as Gayatri, Anushtubh etc. Sama Veda is the earliest known systematic procedure for giving a melody to a verse meant for chanting. Most persons who have heard with devotion the singing of Sama Veda verses will attest to the sense of exhilaration or ecstasy experienced by them. It is no wonder that the famous poem Bhagavad Gita in the epic Mahabharata declares that the Sama Veda is the best among the four Vedas. Each Sama Veda mantra contains in it not only the deep meaning of music. 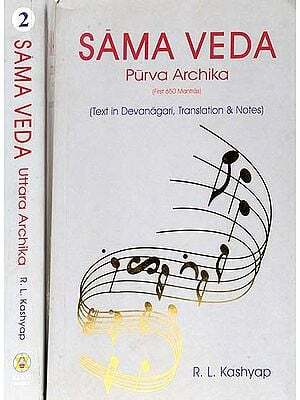 Sama Veda is the Foundation for all systems of music in the subcontinent of India. 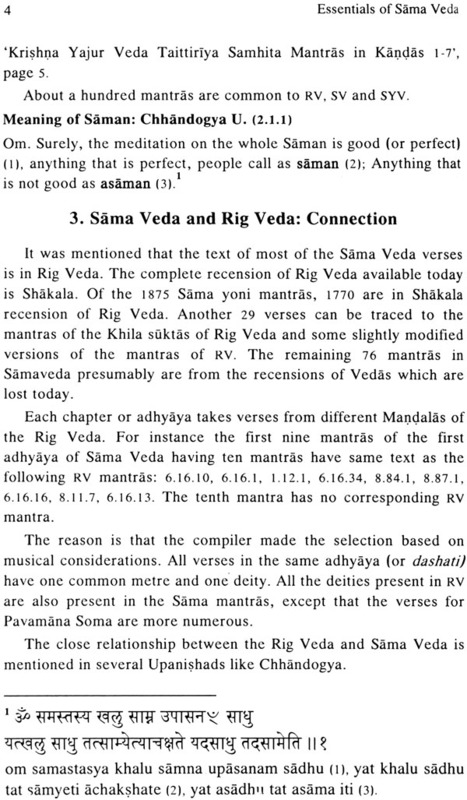 Note however that mantras in Sama Veda are different from the mantras in the other 3 Vedas in one way. In the other 3 Vedas, a mantra is chanted as the text indicates. However this is not the case in Sama Veda. 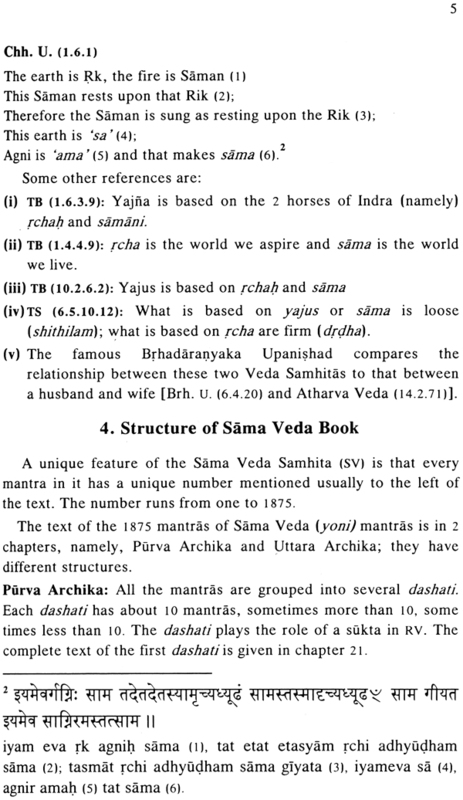 Sama Veda Samhita, in reality, has two parts. The first part consists of the text of the rik mantras which are to be sung. It is properly called Sama mantra Samhita. The second part of Sama Veda gives the text or text for singing. Thus every mantra in the first part, is expanded to yield one or more Samagana mantras. 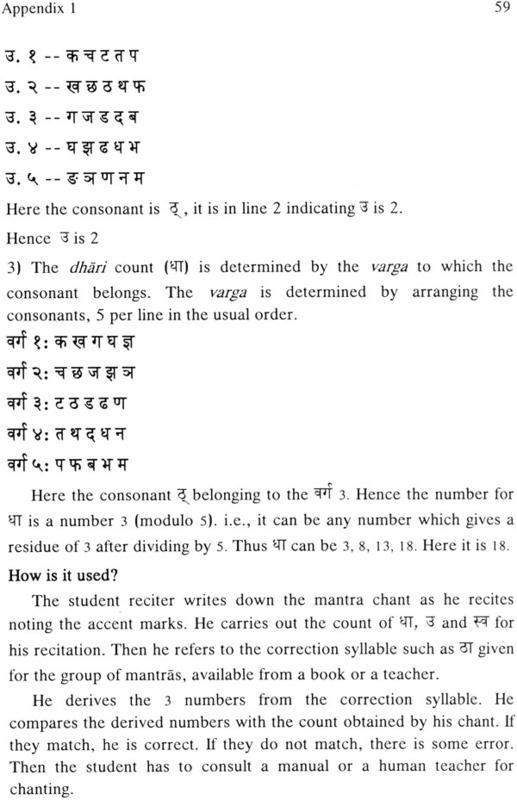 Note that there are also several Samagana mantras which do not have a source rik mantra. 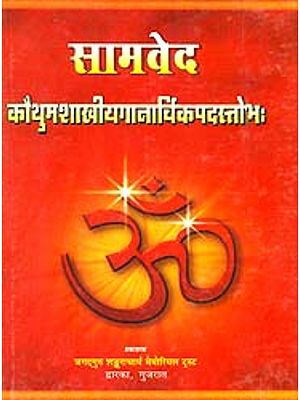 Now, only the book of the mantras of the first part is accessible, with relative ease namely the edition of the Pandit Sripad Damodar Satavalekar having 1875 mantras. The book having the text of the Samagana mantras, is available only in specialized libraries. Hence even the so-called experts call the book with only the first part as the entire Sama Veda. We are happy to present to our readers the second edition of, ‘Essentials of Sama Veda &amp;amp; Its Music’. 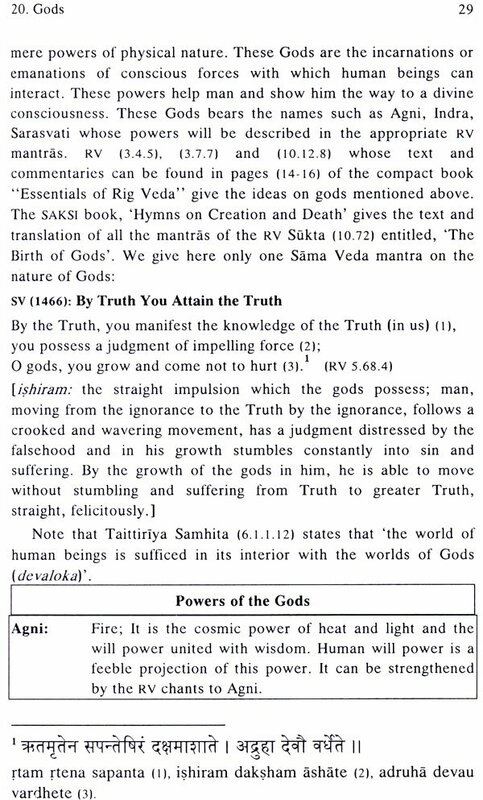 This book on Sama Veda complements our three other books namely, Essentials of Rig Veda, Essentials of Atharva Veda and the Essentials of the Shukla and Krishna Yajur Veda. This book has 32 chapters divided into 3 parts. The Part 1 having 10 chapters’ deals with the general information given here is not original, the presentation of this body of knowledge in a compact from is a highlight of this book. 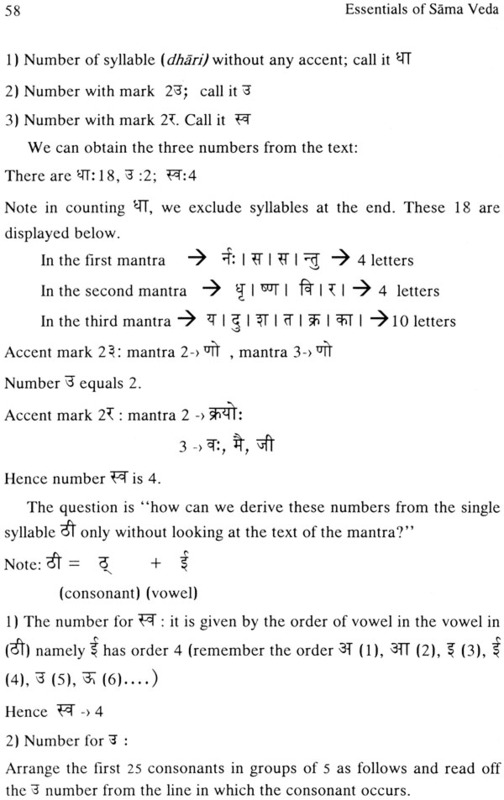 The chapter 19 is particularly interesting because of the use of relatively advanced mathematics in devising a scheme for detecting the errors in the pronunciation of accents during chanting. Part III having 13 chapter deals with the psychological powers associated with the various deities occurring in Sama mantras and the text and meaning of the associated mantras. Note that symbolism is an integral part of the meaning behind these mantras. The psychological powers associated with the deities such as the will-power, clarity of mental operations, inspiration can be developed with the help of these mantras. Understanding the meanings of words in a mantra and their deeper meanings is of great help in this process.